G2E’s Innovation Lab will showcase new technologies shaping future of casinos, sports betting. 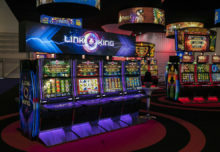 Global Gaming Expo 2018 (G2E), North America’s premier international gaming trade show and educational event presented by the American Gaming Association and organized by Reed Exhibitions and taking place in Las Vegas October 8-11, released its Innovation Lab lineup for 2018, featuring new innovations shaping the future of the gaming industry including the use of beacons and artificial intelligence. What does it mean to be a “connected resort”? We believe the best definition is to bring your Casino’s data to bear, just at the right moment, to engage customers, to enhance their experience at your resort and or casino all while providing a platform that is user friendly. The examples are endless for how this can enhance customer engagement, up sell resort services; dining experiences; offer discounts, point out advantages, remind the customers of their reservations and itineraries. Come learn how ConvergeOne has built an AI-driven chatbot platform that is cross functional making this easy to build, deploy, and maintain so you can start engaging your customers in exactly the way they want, and delight turning a onetime customer into a loyal customer.